Jason Rezaian convicted in Iran. What can the U.S. do to bring home the Washington Post reported and other Americans imprisoned in Iran? 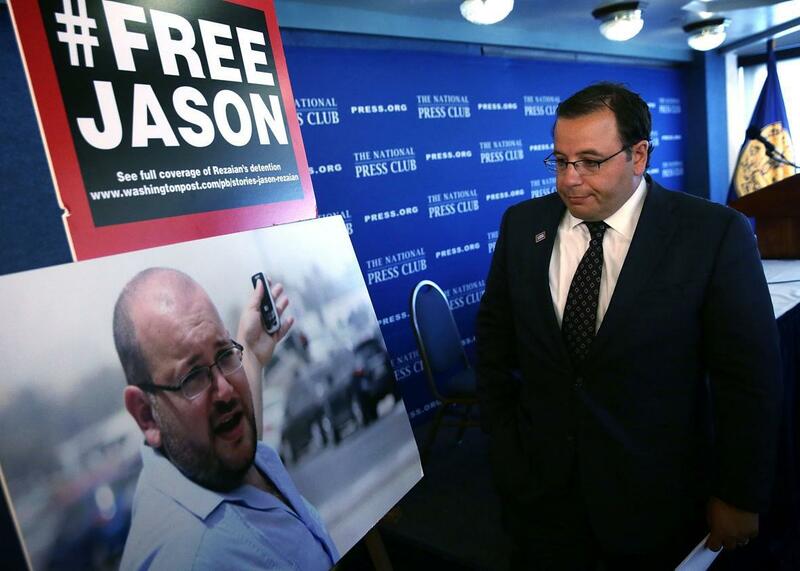 Washington Post Reporter Jason Rezaian Convicted in Iran. Will the U.S. Do Anything to Get Him Home? Ali Rezaian looks at a picture of his brother, Washington Post Tehran bureau chief Jason Rezaian, after a news conference at the National Press Club on July 22, 2015, in Washington, D.C.
Washington Post Tehran correspondent Jason Rezaian was convicted in Iran on charges of espionage, according to a statement from a court spokesman on state-run Iranian television. Details about the trial, held in one of Iran’s secretive high-security “Revolutionary Courts,” have been murky from the start, and a lot still remains unknown about the verdict—including the sentence. Rezaian, a dual U.S.-Iranian citizen, potentially faces up to 20 years in prison. Rezaian, also a contributor to Slate and known for his illuminating feature stories on ordinary Iranians and Iranian culture, was arrested in July 2014, meaning he has now been detained longer than the Americans held in the 1979 hostage crisis. It was months before he was able to receive a visit from his attorney or his wife—who was arrested with him but later released on bail—and he has reportedly suffered from a number of serious health conditions following months of solitary confinement and aggressive interrogations in Iran’s notorious Evin Prison. Rezaian’s trial ended two months ago. He has been accused of providing information to the U.S. government about Iran’s nuclear program as well as about people and businesses evading international sanctions. The scanty evidence of Rezaian’s collusion with the U.S. government reportedly included a visit to the U.S. consulate to obtain a visa for his wife, an Iranian citizen, and a letter he wrote requesting a job in the Obama administration back in 2008. Many suspect that hard-liners within the Iranian government are using the allegations against Rezaian to discredit President Hassan Rouhani’s attempts to negotiate a nuclear accord with the United States. Rezaian’s attorney will likely file an appeal, but his ultimate fate is more likely to be decided at the diplomatic negotiating table than in a courtroom. Rouhani has floated the possibility in recent weeks of a prisoner exchange, trading Rezaian and two other Americans held in Iran for Iranians held in the U.S. on sanctions violations. The other two Americans are Saeed Abedini, a Christian pastor, and Amir Hekmati, a former U.S. Marine. A fourth American, a former CIA contractor named Robert Levinson, disappeared in Iran in 2007, but Iranian officials deny knowledge of his whereabouts. The Iranian government says that 19 of its citizens are being held on sanctions violation charges and should be released now that many of those sanctions have been lifted following the recently concluded nuclear agreement. Rouhani suggested that the recent deal had opened room for dialogue between the two countries, which would seem to contradict Supreme Leader Ayatollah Ali Khamenei, who recently banned further negotiations with the United States. The Obama administration resisted pressure from some critics to include the cases of the detained Americans in the nuclear talks but says it is still working to free them. It’s not quite clear yet what concessions they might make to do so.